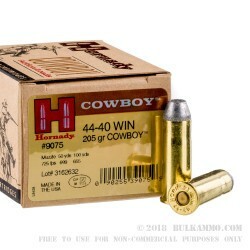 Designed to give an authentic cowboy action experience, Hornady’s Cowboy Action line provides a gateway into the past with this high performing .44-40. 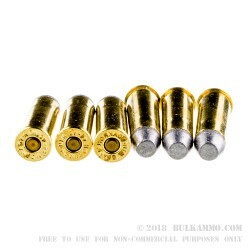 These rounds are loaded with a 205-grain lead flat nose projectile, into boxer-primed, noncorrosive, reloadable brass cases and are capable of a muzzle velocity of 725 FPS. The swaged flat nose projectile is designed to flatten versus fragmenting and feature a special knurling and grease ring for less leading and better positioning in historically accurate revolvers. 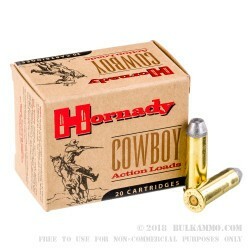 These rounds are ideal for a fun day at the range with your favorite single action revolver, for cowboy shooting matches or even for varmint hunting. 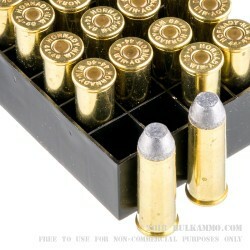 Each box of Hornady .44-40 contains 20 rounds. Based in Grand Island, Nebraska since 1949, Hornady has been an American manufacturer of quality reloading supplies. With the introduction of their ammunition line in 1985, Hornady has become a major manufacturer of quality ammunition for target, hunting and self-defense situations.